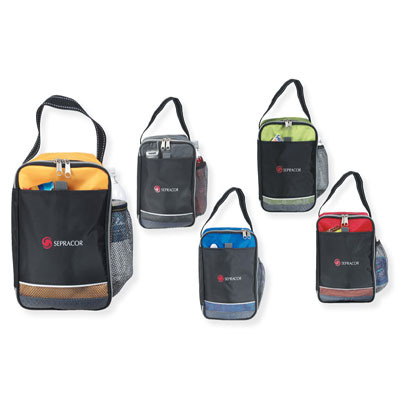 Front slip pocket with mesh trim, mesh water bottle pocket, zippered closure on main compartment, poly web carrying handle, waterproof liner, holds ice. Size: 7" x 10" x 4 1/2". *There is a 8 % surcharge on the price of this calendar if it is shipped to California, Tennessee, or Maryland, so the price per calendar shipped to these states will be 8 % more than you see on the website. This surcharge will not be reflected on the order form, but will added to your total and charged on your credit card. Imprint Area is: 4" x 3"
50 1 color(s) imprint at $403 ONLY $8.06 each. 50 2 color(s) imprint at $475 ONLY $9.50 each. 50 3 color(s) imprint at $547 ONLY $10.94 each. 150 1 color(s) imprint at $875 ONLY $5.83 each. 150 2 color(s) imprint at $1,032 ONLY $6.88 each. 150 3 color(s) imprint at $1,189 ONLY $7.93 each. 250 1 color(s) imprint at $1,417 ONLY $5.67 each. 250 2 color(s) imprint at $1,596 ONLY $6.38 each. 250 3 color(s) imprint at $1,794 ONLY $7.18 each. 500 1 color(s) imprint at $2,675 ONLY $5.35 each. 500 2 color(s) imprint at $3,051 ONLY $6.10 each. 500 3 color(s) imprint at $3,427 ONLY $6.85 each. 1000 1 color(s) imprint at $5,085 ONLY $5.09 each. 1000 2 color(s) imprint at $5,744 ONLY $5.74 each. 1000 3 color(s) imprint at $6,414 ONLY $6.41 each.